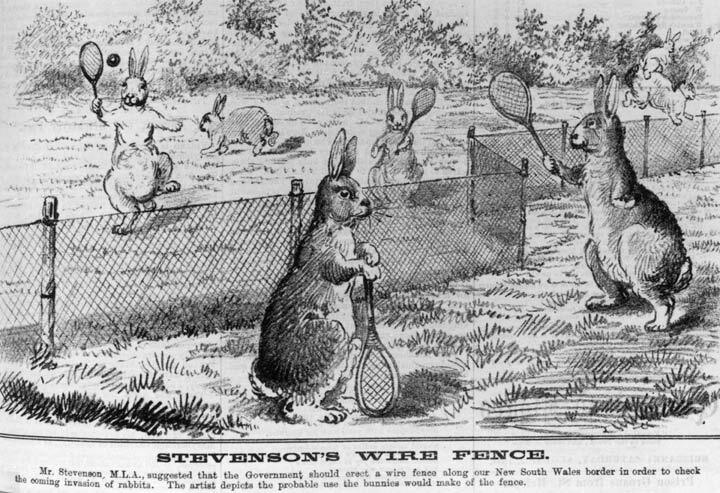 This black-and-white cartoon satirises Queensland parliamentarian John Stevenson's suggestion that a fence be built on the New South Wales border to stop an expected invasion of rabbits. It depicts a low wire fence that four rabbits are using as a tennis net. Other rabbits leap over the fence and hop in the background. Lush grass and bushes can be seen. The caption says that the cartoon 'depicts the probable use the bunnies would make of the fence'. The cartoon appeared on the front cover of Queensland Figaro and Punch on 2 August 1884. 'Rabbit fences' were intended to control the spread into Queensland of what would become Australia's most destructive introduced species. Rabbits have caused large-scale losses in agricultural production, forcing some farmers to abandon their properties. In some areas they have also caused severe degradation of pastures, erosion, a sharp reduction in stock-carrying capacity and a lowering of land values. Rabbits, depicted here as harmless and playful, have the fastest rate of spread - up to 100 km per year - of any colonising mammal anywhere in the world. Rabbits had been in Australia since the arrival of the First Fleet but their numbers increased quickly after Thomas Austin released 24 wild European grey rabbits for hunting purposes at his property near Geelong in 1859. By 1918 the nation's rabbit population was estimated to be almost 400 million. By depicting the rabbits playing on both sides of the fence the cartoonist suggests that it is already too late to stop them, and in fact delays in taking action meant that rabbits had already invaded parts of Queensland by the time the fence was built. Parliament had passed the necessary laws in 1878 and 1880 but tenders were not passed for the construction of a rabbit-proof border fence until 1886, by which time rabbits were already being reported in south-western Queensland. By 1929 more than 47,000 km of rabbit-proof barrier fences had been constructed in Queensland, but the fences had only limited success in restraining rabbits. Not only had rabbits already spread to many areas, but adequate maintenance of the fences was labour intensive and therefore expensive, and so many fences fell into disrepair. In addition, rabbits were able to burrow under many of the fences. Today only 555 km of rabbit fence continues to be maintained in Queensland. Other early efforts to eradicate rabbits included fumigating their warrens with poisonous gases, deep ripping the warrens, laying metal traps and poisonous baits, shooting the rabbits and hunting them with packs of dogs. These methods had little overall effect. Only biological methods such as the release of the diseases myxomatosis (1950) and rabbit calicivirus (1995) have been effective in reducing numbers, although biological adaptation means constant vigilance is necessary.